Police recommended a non-indictment for the Gyeonggi Province governor’s election rival and an actress who has claimed to have had an affair with the governor, as they referred the case to prosecutors. Gyeonggi Province Gov. 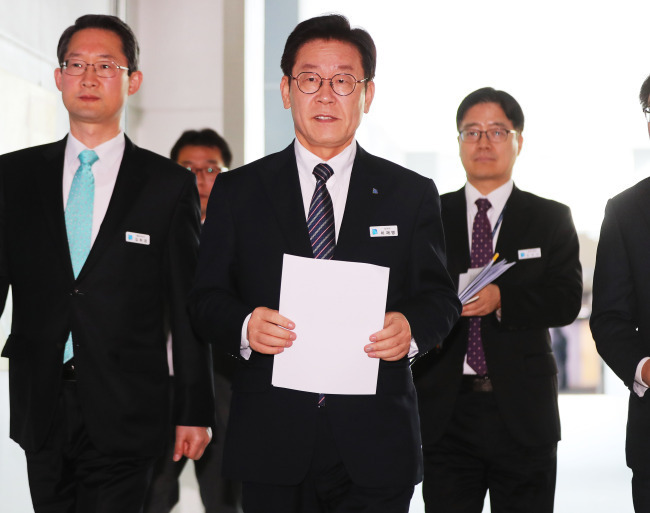 Lee Jae-myung filed a complaint in June against former gubernatorial candidate Kim Young-hwan of the Bareunmirae Party and actress Kim Bu-seon, accusing them of violating the election law by publicizing falsehoods. The two Kims claimed that Lee had an extramarital affair with the actress in May 2009 at her home in Seoul. The Bundang Police Station said on Thursday that it suggested a non-indictment for them both when it referred the case to the prosecution last week. A team of Lee’s campaigners dealing with “fake news” claimed Kim was on Udo, a small island just east of Jeju Island, on the date of the alleged meeting. Lee, on the other hand, said he had visited Bongha, South Gyeongsang Province, upon the death of former President Roh Moo-hyun on May 23, 2009, and set up a memorial altar the next day in Bundang at which he was the chief mourner. After questioning Lee, candidate Kim and the actress, police decided to recommend a non-indictment, citing lack of evidence. The Seongnam branch of the Suwon District Prosecutors’ Office is now looking into all cases related to Lee’s “actress scandal,” including a suit filed by Kim to the Seoul Southern District Prosecutors’ Office against Lee for election law violation and defamation under the law on information and telecommunication network.